At 9:32 last night, the creative force behind black metal legends Darkthrone, was arrested at Toronto’s Pearson International Airport with a copy of the 1997 album “Spiceworld”. Apparently, Fenriz was on his way through security attempting to catch a flight to Trondheim when an astute security guard noticed the album in his bag. The album, rapped in coffee beans in an attempt to throw off Spice Girl album sniffing dogs, was confiscated and Fenriz was escorted off to jail. He currently sits in Mimico Correctional Centre awaiting his release on 300,000-dollar bail. 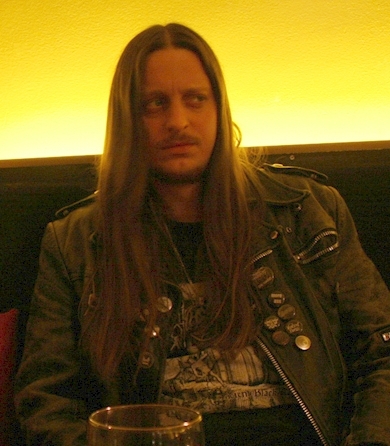 Fenriz, for his part, initially claimed the album was not his, but that he was actually carrying it for an unnamed friend. However, after intense questioning a tired and bewildered Fenriz broke down and admitted that he had purchased the album because he “couldn’t get that ‘Spice Up Your Life’ song out of his head” no matter how hard he tried. Not only could Fenriz be facing three to five years hard labor for his possession of the album, there is a good possibility that he will be an outcast from the black metal world. The National Association of Black Metal Bands, a 100,000-member organization committed to keeping black metal pure, has already considered banning him from taking part in church burnings for the next five years. They have also considered taking the unheard of step of indefinitely suspending him from throwing parts of animal carcasses into the crowd during concerts. The only such probation in the past took place in 2003 when Dani Filth was prohibited from using the word “Satan” for one year for what was referred to as “crimes against black metal”. In Filth’s case, the so-called “death penalty” was considered, a sanction that would have been forced to record an entire album of Air Supply covers. Many metal artists have already come to Fenriz defense. According to Megadeth frontman Dave Mustaine listening to the Spice Girls is not healthy but “at least he wasn’t trying to marry another man or receive free health care like most people in Canada do.” Immortal frontman Abbath also indicated that he’d support Fenriz if he joined a twelve-step Spice Girl rehabilitation program. “Free Fenriz” tee shirts have already been popping up around Norway and Cleveland, Ohio. It’s entirely possible that with a good attorney and the power of prayer, he will overcome this terrible transgression and become an upstanding citizen once again. This entry was posted on March 9, 2012, 4:00 PM and is filed under General Weirdness. You can follow any responses to this entry through RSS 2.0. You can leave a response, or trackback from your own site. If my metal credibilty is in jeopardy because I have always loved the song “Wannabe”, and have had a crush on Ginger Spice, well then, screw it… who needs metal cred anyway?? Great job, Mista! Welcome back to Terra Firma! Thanks! Nice to be here!!!! I really did like that “Spice Up Your Life” song! I’ve gotta admit, I’m a “Viva Forever”-addict. I can’t tell my friends or family. But this incident gives me hope and strenght and it indicates that Borderline-Spicism isn’t a stranger in the Black Metal scene. I’m glad about that, because now I don’t feel so alone anymore. This is a terrible crime but I’m inclined to forgive him because he’s Fenriz. how is marrying another man non-metal!